The quirky name of this restaurant, which is a clever play on words, is not one that you are likely to forget in a hurry, and neither is the restaurant itself once you have paid a visit. Having moved from Hatfield to its new location in Menlyn, owners Frikkie and Rikkie Marais has set about re-creating the unique interior which has made BOER’geoisie stand out from the crowd. The larger premises situated in Greenlyn Village, have plenty of safe parking right outside the door, as well as a spacious covered front stoep for al fresco dining. The skillful combination of corrugate iron, aged metal pillars, oregon doors and wooden floors all assist in creating the illusion that one has stepped back some 50 years into an old fashioned store in a small platteland town. Picture BOER’geoisie in Menlo Park, Pretoria Central, Pretoria region / Tshwane, Gauteng, South Africa The atmosphere is superb, and owners Frikkie and Rikkie Marais has assembled an impressive treasure trove of South African memorabilia that is both fascinating and amusing. It is not surprising therefore that Bistrot BOER’geoisie has built up a large clientele of regular customers who enjoy good wholesome food in an authentic atmosphere. Visitors to Pretoria should ensure that a visit to Bistrot BOER’geoisie is definitely on their agenda if they wish to sample genuine South African hospitality. The indoor/outdoor flow will be further enhanced by the new entrance (which leads directly from the nursery) and additional seating area in garden-like setting. 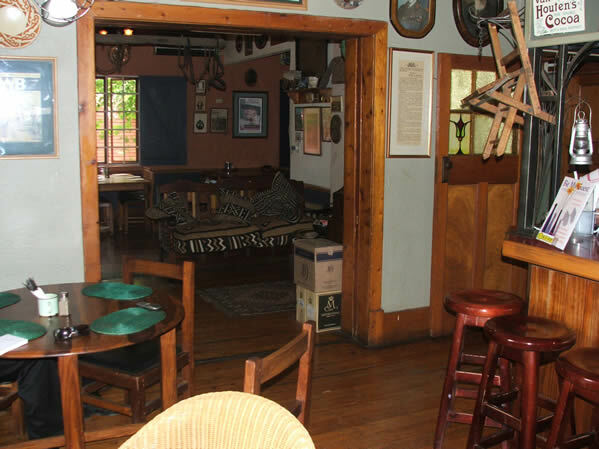 Picture BOER’geoisie in Menlo Park, Pretoria Central, Pretoria region / Tshwane, Gauteng, South Africa The menu offers a good combination of traditional South African dishes and the more continental bistrot style. Starter recommendations include Chicken ‘Vinkies’ – chicken fillet rolled with feta cheese and a creamy lemon sauce and deep-fried to perfection, or the traditional Skilpadjies – spicy ground lambs liver rolled in caul then grilled and served with onions. Recent additions to the menu include a delicious Oxtail Pate, Wild Thing, and Kaaings (lamb crackling). Main course specialities are definitely the Potjies which offer everything from lamb stew with dumplings to tripe and trotters with onions. The Venison Pie is also highly recommended. All main courses are accompanied by vegetables of the day and an excellent choice of starch – chips, samp, wheat, rice, pap or mashed potato.